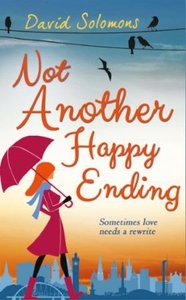 Sometimes love needs a rewrite The stunning romantic comedy from David Solomans, Winner of the 2016 Waterstones Children's Book Prize With her debut novel, Happy Ending, JANE LOCKHART pulled off that rare double - critical acclaim and mainstream success. But now, with just the last chapter of the follow-up book to write, she encounters crippling writer's block. She has no idea how her story ends... This is not good news for her publisher, TOM DUVAL. His company is up against the wall financially and the only thing that will save him is a massive hit, in the form of Jane's next novel. When he discovers that his most important author is blocked, Tom realises that he has to unblock her or he's finished. Everyone knows that you have to be unhappy to be really creative, so Tom decides that the only way he's going to get her to complete the novel is to make her life a misery... Set within the Scottish publishing industry, and filmed against a stunning backdrop of both romantic and hip Glasgow locations, Not Another Happy Ending is perfect for fans of One Day. ?Engagingly watchable" - Mark Adams, Screen Daily ?...has more heart than most Hollywood rom-coms...an entertaining diversion and an example of mainstream Scottish cinema that easily holds its own" - Rob Dickie, Sight On Sound About the author David Solomons is the BAFTA-shortlisted screen screenwriter of The Great Ghost Rescue, The Fabulous Bagel Boys and Five Children and It. He lives in Dorset with his wife, Natasha Solomons, and their young son. Not Another Happy Ending is his first novel.